This certification course was created as an introduction to aromatherapy and essential oils. Each class is divided into two parts. The first half of each class is dedicated towards the science and applications pertaining to the body systems covered that day. We will discuss the common ailments of these systems and the essential oils helpful for those ailments. The second half of each class focuses on consultations, blending and working with the oils. Participants pair up, perform consultations and create a blend for their partner to use until our next class. The educational goals for this certification program are to instill a strong foundation in the art of blending essential oils as well as to educate ones sense of smell, enabling clear distinction between the myriad of oil lines and their varying levels of quality. The material fee for this course covers all bottles, jars and oils used during the class, as well as all handouts, aphrodisiac ingredients, powder and bath salt bases. 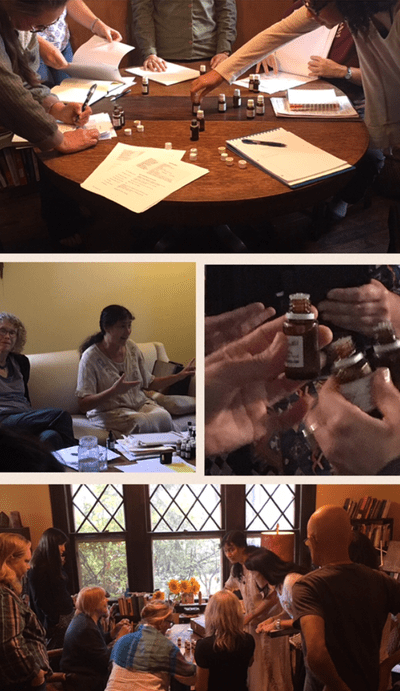 This course was designed for those who want to further their knowledge of essential oils, and bring insight to those desiring tools for channeling information. The educational goal is to expose people to different methods of selecting essential oils. It begins with divine intervention, and using our intuitions as well as pendulums as tools for dowsing. From there our journey takes us to kinesiology, where we learn to communicate directly with the body. In doing so we are able to select the oils best suited for each condition. Our journey continues with the chemistry of essential oils. By delving into the chemical makeup of these complex oils and using their constituents to determine our selections, we ingrain their properties into our repertoire of knowledge. These methods of blending are guided by body mind and spirit. They are synergistic and balance our knowledge as aromatherapists. This course also covers reflexology as a mode of transporting the oils into the body. Learning the reflexes allows us to promote healing from the inside out, and gives us one of the greatest tools of absorption for essential oils. In addition to reflexology we also learn how essential oils are made by distilling plant material in class. We will discuss hydrosols their benefits and how they can be used. AromatherapyAndHerbalStudies@gmail.com Linda Patterson Copyright 2019 © The Eclectic Institute of Aromatherapy and Herbal Studies. All rights reserved. Subscribe to our Newsletter and get updates on classes, promotions, and posts!